Monday’s family-friendly, Dorchester-themed Christmas celebration at the Strand Theatre hit all the right notes. 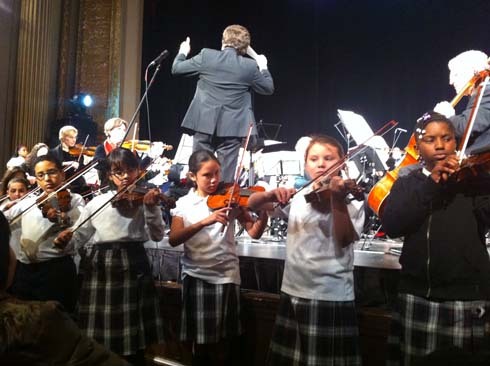 The event was staged by the Boston Classical Orchestra, whose executive director, Sean Roberts, lives on Jones Hill and has taken a special interest in reviving the Columbia Road theatre. His enthusiasm and vision for the Strand is precisely the brand of homegrown stewardship that will be needed to keep the city-owned theatre viable and vibrant in the years to come. The orchestra is mainly associated with Boston’s Faneuil Hall, where it performs regular weekend concerts. Roberts wants the BCO to establish a residency at the Strand as well. Monday’s show drew about 450 people to the 7 p.m. performance— not a bad crowd considering the hour and the conflict of a marquee Monday Night Football game. But, the seeds of a larger success were clearly visible. The BCO wisely partnered with several outstanding Dorchester outfits— including the Pope John Paul II Academy’s choir and string ensembles and the Boston City Singers. They enlisted the Dorchester Arts Collaborative, which arranged for cupcakes for the post-concert reception. This all-hands-on-deck approach is what’s been missing from the Strand’s management in recent years. It will take a broad network of supporters— led by an active and imaginative community board— to steer the stately theatre into a new era of relevancy. We don’t have that now and that’s something that must change moving forward. It’s good to know that the city officials charged with improving the Strand’s programming were quick to embrace this idea for Monday’s show. The BCO— under the direction of the energetic and warm Steve Lipsitt— delighted the audience with a just-right selection of holiday classics and pop tunes. By swinging the spotlight onto our neighborhood, and the Strand in particular, these fine musicians delivered an early Christmas present to a slice of this city that sorely needed a lift. Encore!